Here is a fine example of a perfectly good book that is basically unnecessary. It’s 400 pages of (according to the subtitle) “The High-Flying History of America’s Most Enduring Hero.” If Tye had spent his 400 pages on THAT topic -- an examination of WHY Superman is American, and Enduring, and a Hero -- then this book would have more of a distinctive niche. But as it is, it is more of an explication of a broad Superman history, for the under-initiated. This book is kind of like a lot of the books in any well-defined category: Nothing really wrong with them, and fine as a kind of overview, but not really special enough to warrant purchase by the true aficionado. There are a few indications that the book was NOT written or proofread by one of us “Super Aficionados”: In the photo section, a staged publicity photo of Noel Neill and George Reeves (in their Kent and Lane wardrobe) contains the statement that “off the set George Reeves could relax with Noel Neill, who played Lois Lane …”. First off, the fact that the actors are dressed in their filming wardrobe (complete with pillbox hat for Neill and buttoned double-breasted suit for Reeves) indicates that they are NOT relaxing, but WORKING by POSING for publicity shots. Secondly, it is well-known by fans that Reeves did NOT “relax with” other cast members offset. They were a friendly “family” at work, but Reeves went his own way socially offcamera. Another small error is on page 170, in Tye’s discussion of the Silver Age “Weisinger Explosion” of characters that survived Krypton’s destruction. He mentions Kal-el’s dog Krypto, and then says, “Beppo the Super-Monkey and Titano the Super-Ape took similar paths to Earth.” Umm, wrong! The first part of Tye’s statement is correct. 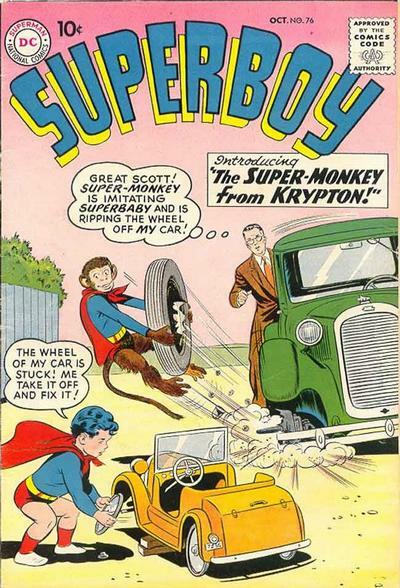 First introduced in Superboy #76 (cover-dated October 1959) and given his cute name later, Beppo was an experimental Kryptonian lab monkey sent into space in another of Jor-El’s rocket trials. Beppo later became a member of the Legion of Super-Pets. The second part of Tye’s statement is an incorrect conflation of two characters. 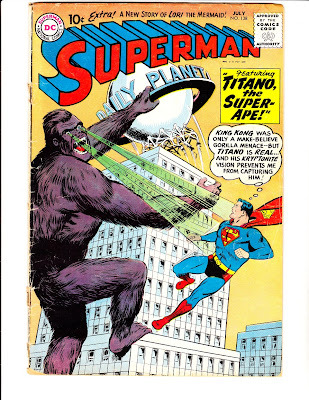 The character Titano is indeed called “Super-Ape” in the story title, but he is NOT from Krypton. As told in the Silver Age, the Filmation cartoon series, and the Byrne refit, Titano is an American space research chimp launched into orbit. His capsule underwent irradiation from a passing Kryptonite meteor and on his return, Titano became a giant, rampaging beast with Green-K vision -- but who still remembered his kind treatment by Lois Lane, which was a key to his eventual neutralization and capture. Now, THIS character came from Krypton, and he is *kind of* a Super-Ape as told in the February, 1958 issue #238 of Action Comics. He’s actually a Kryptonian guy zapped by a devolution ray, which turned him into a gorilla, and then sent into space long ago. Later he crash-lands on Earth, and Hilarity Ensues. After “King Krypton” (the name given him by Jimmy Olsen -- sounds like a “wrassler” to me!) has gone several rounds with Superman and eventually ends up beaten to a pulp, he sort of re-evolves and groans a mea culpa before expiring due to Green K exposure. So, thanks to all of this erudite commentary by Yours Truly, you know know that, contrary to Tye’s statement, “Titano the Super-Ape” did not take a similar path to Earth as Krypto and Beppo. 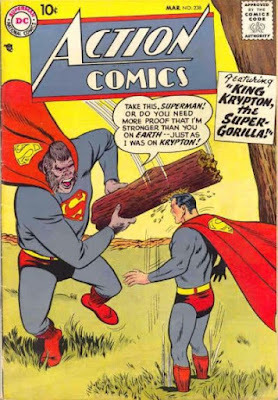 King Krypton the Super-Ape DID, however. Anyway, with that super-obsessive correction out of the way, let me again state that this book was a lot of work for Tye. It’s not bad at all. 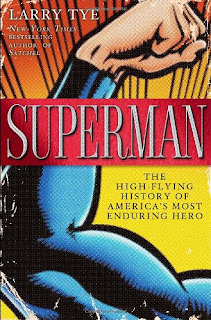 But it’s not a feverish, inspired book with anything in it to make it really exceptional among the other many books that chronicle Superman’s development from origin to icon. I am glad I could read it as a library book, and did not buy it, because it really didn’t tell me anything new. I think any Superman fan would enjoy it, but if you can read it without buying it, your wallet will say Thank You when you are finished.